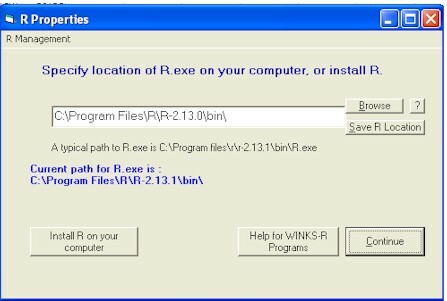 In order to run the R programs within WINKS, you must first install the free R program on your computer. For basic information on runng R in Windows, click here. To go to a download site (Berkley) click here to display the R for Windows page . To install R for the first time on your Windows PC, click on the base link on the R for Windows page. Follow the instructions on this site to install R on your computer. Once you have installed R on your computer, do the following steps to set up WINKS to run R programs. where R-2.13.0 is the version of R you have installed. Once you locate R.exe, hichlight it and click Open. You are prompted "Save specified R.exe location) Answer Yes. Another dialog box will indicate "R properties saved." Click Ok and Continue. Your WINKS is now set up to run WINKS R programs.